3 July 2014 — Timber. Pre-fab. Affordable. Medium density. These are the sustainability buzzwords repeating in The Fifth Estate residential articles at the moment, and Australand has put all four together with its recently constructed The Green apartment complex in Parkville, Melbourne. And what’s more, it’s saving 25 per cent on construction costs, which Australand says could lead to more medium-density housing in middle and outer suburbs where concrete construction is currently not economically viable. 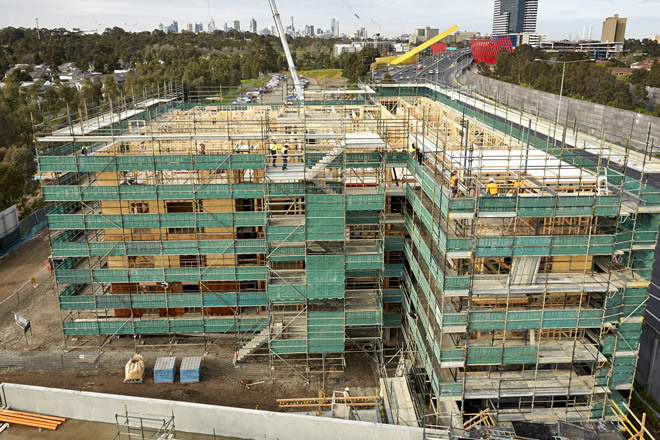 The 57-unit, 5100 square metre apartment, the first five-storey timber-framed building in Australia, was built by Australand in conjunction with Citta Property Group, using a process they have developed called “hybrid construction”. This process, currently used on around 50 per cent of Australand’s medium density houses and apartments, employs tradesman that typically build houses in the suburbs who have been trained in commercial disciplines such as onsite management, procurement, programming and safety, rather than engaging a full commercial operation. It also utilises a range of prefabricated parts, including flooring cassettes, wall panels and roof trusses. The building was constructed in layers, with the floor of each level “dropped in” by crane using prefabricated flooring cassettes while the internal walls were simultaneously installed. An advantage was that within 24 hours, workers could start putting in the services, and the prefabricated walling systems were able to be installed concurrently as the levels above were being completed. The structure of the building is all timber, with Australand and Citta saying the hybrid construction process would allow timber’s “revolutionary return as a construction material for big buildings”. This has led to a massive reduction in materials used, and weight. While the basement and suspended slab use around 400 cubic metres of concrete, the rest of the building structure – the walls and floors of the other five levels – uses only 500 cubic metres of timber all up, 70 per cent of which has been locally sourced and certified. Australand believes this minimisation and local use of materials will amount to a significant reduction in embodied energy compared with a baseline of typical concrete construction. In fact, according to Australand sustainability manager Paolo Bevilacqua, RMIT has been engaged to perform a lifecycle analysis of the building, with results expected later this month. Along with the sustainability benefits are some solid economic outcomes. The aim of the hybrid construction process has been to deliver apartments in the price range of “middle Australia”, Australand says, with some big savings being realised. 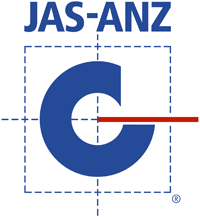 “We are saving on average, on a per apartment basis, up to 25 per cent on built costs over conventional concrete,” Australand estimating manager Kase Jong said. Time savings have been a big driver of cost reduction, and while the building had a 12-month build program, the actual timber structure construction time was 12 weeks, which included the roof trusses and all the flooring cassettes. According to Mr Jong, the hybrid construction process shaved a week off each floor’s build time, meaning the building was completed a month earlier than a business as usual approach. 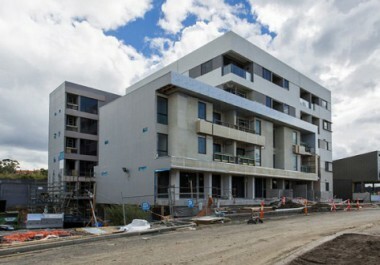 According to Craig Muse, Australand development director – built form, labour and material costs were also a factor, with the method of construction taking full advantage of domestic labour and supply chains, which produced “more cost effective building developments for large-scale residential projects”. 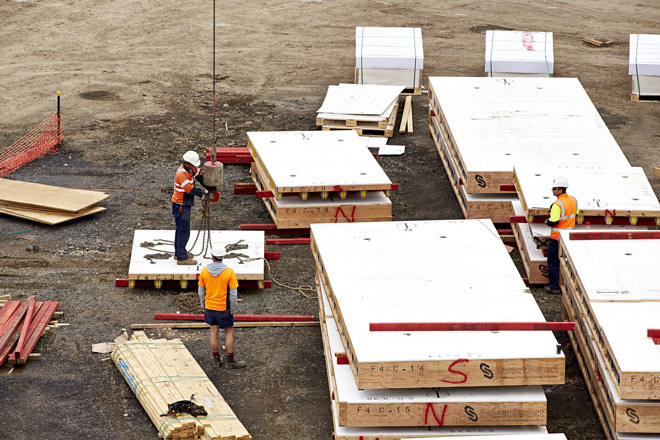 The construction of five and six storey timber-framed buildings overseas is commonplace, and subcontractors operating in the hybrid construction space there is extensive, leading to a competitive market. 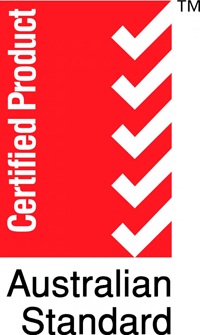 In Australia, however, subcontractors able to undertake this type of work is still limited. Mr Pradolin said this was a great opportunity for domestic trades to up-skill in order to build multi-storey timber apartments safely and efficiently. “It was definitely a challenge to find the right domestic trades to be able to deliver what we envisioned and it required Australand to commit to ensuring the proper training was undertaken,” Mr Pradolin said. Mr Pradolin said Australand’s approach to safety drove the innovation of the cassette system, which they believe will revolutionise the way this type of housing is delivered into the future. This should also lead to an increase in demand for the product and therefore additional prefab manufacturing jobs. Aside from the carbon and embodied energy savings of timber, the building has some other impressive sustainability features. High-performance glazing increased the building’s acoustic performance and energy efficiency. An Exsulite-Kooltherm thermal facade system developed jointly by Kingspan Insulation and Dulux AcraTex also played a large part in the energy efficiency of the apartments, which have an average performance rating of 6.2 NatHERS stars, and with the inclusion of a solar PV system will be closer to seven stars. The Green is located right on Melbourne’s capital city bike trail, and the apartment complex features 48 bicycle racks in a secure enclosure to assist in promoting active transport. Toilets and laundry fixtures boast 4 Star WELS ratings, while the basin mixers have a WELS rating of 6 Stars. The building also has high indoor environment air quality, with the extensive use of low VOC paint and E0 rated (formaldehyde emissions of less than 0.5mg/L) skirting and architraves, improving on the current Australian standard of E1. The concept architect for the project was SJB Architects.